Image caption Vicki Russell told the CBC. "In all my years of travelling, I have never had a travel person treat me so badly"
A Canadian woman missed a "trip of a lifetime" Galapagos cruise after being bumped from a flight. Vicki Russell told the CBC that Air Canada bumped her from the 1 April Toronto-to-Miami flight that she had booked two months in advance. As a result she missed her connecting flight to meet the cruise ship. 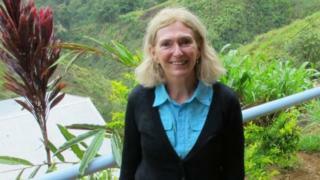 Ms Russell has since received C$800 (US$592; £463) compensation from the airline. She says everything went according to plan until an agent told her about two hours after she had checked in and received her boarding pass that the flight was overbooked and she did not have a valid ticket. Can airlines 'bump' people off flights? Despite showing her travel documents and getting the tour company to email her trip receipt to prove her ticket was valid, the flight left without her. "It was extremely upsetting," Ms Russell told the CBC. "The woman could not have been more rude, hostile. In all my years of travelling, I have never had a travel person treat me so badly." She was sent to Air Canada customer service at the airport to find a new flight to Miami. By the time she was seen by an agent, no flights were available that would allow her to make the connection. She also had to wait to get back her checked luggage. She filed a complaint for missing her "dream vacation" with Air Canada the next day. The $10,000 National Geographic cruise, organised by Lindblad Expeditions, tours the famous Pacific Ocean archipelago's varied islands and habitats. A spokeswoman for Lindblad Expeditions said on Friday they have been in contact with Ms Russell throughout the situation and have rebooked her expedition at no charge, including airfare from Miami to Galapagos. Air Canada confirmed that the flight had been oversold. But the carrier said their agents spent "a great deal of time" looking at options for Ms Russell, including exploring "outside the box" solutions for getting her directly to the Galapagos Islands despite her flight ticket being issued only to Miami. They noted they refunded her initial fare and paid compensation. "This is a very regrettable situation and we are sorry this occurred," said an Air Canada spokesman in a statement. The practice of airlines bumping passengers from flights has been under scrutiny since the footage of United Airlines passenger David Dao being forcibly removed from a flight made headlines worldwide. Following that incident, Canada's federal government reiterated its pledge to table a passenger rights law this spring. It is expected to include compensation rules for those denied boarding due to factors within the carrier's control. The Canadian Transportation Agency receives an average of about 50 complaints a year from passengers saying they were denied boarding.